July 2012—It’s Saturday morning and 15-year-old Daniel Godinez catches the bus from his home twelve miles outside of Santa Barbara. With transfers and delays, he pieces together a two-hour circuitous ride to the Museum of Natural History, the sprawling stucco and tile casa ranchero-inspired building, nestled creek-side amidst foothills that rise into mountains. He walks along an empty parking lot, past an enormous blue whale skeleton, through the adobe entrance, and cuts a diagonal across the open courtyard. Pulling the door open, marked “Gladwin Planetarium,” he feels his way along a dark aisle towards control booth, and senses the awesome presence of the shadowed dome overhead, as if being watched. In less than an hour seats will fill for the first show of the day; but for now he is alone. This is Daniel’s moment; he is about to turn on the universe. If you had happened to take a seat that morning, leaning back, you would have been guided through the wonders of our solar system and beyond, by an upbeat and articulate astronomer who appears far too young to be versed in 14 billion years of cosmic arcana. How did this young man get to where he is? When did the stars begin to glow in his sky? Daniel, it turns out, is not the son of a scientist; no uncle of his is an amateur astronomer; nor did he grow up in the shadow of Griffith Observatory. Daniel, in fact, is the son of Mexican immigrants with little formal education. While his launch pad is the public school system, and his rocket fuel is his own drive, his achievement is also a testament to the importance of science electives, and a responsive network of educators who cared enough to go beyond their paid orbits. In the winter of 2009 Daniel’s junior high science teacher announced one day the opportunity, “to use a really big telescope across the world.” The concept was wholly new, the allure immediate and intense. But Daniel was not the sort of student to step forward for science electives. True, he worked at his studies, but this native Spanish speaker, with only six years of English, faced the same difficulties as others in his demographic, and produced an undistinguished record of low test scores and missing work. His teacher, however, proved persuasive, insisting the activity was within reach of any student who desired it, and not just a perk for ‘A’ students. Daniel signed up. This fact alone is noteworthy, when you consider the social realities and trends. Daniel’s parents work in the service sector of Santa Barbara. Like many Mexicans they value family, religion, and practical abilities. It is not unusual for teens to forfeit secondary school in order to enter the work force, even to marry. Although Daniel was enrolled in AVID (Advancement Via Individual Determination), a public school program intended to promote first-generation college-bound students, in practice the study skills class felt stagnant to him, like a dumping ground for language-limited low-achievers. But all of this changed when he encountered the FTP. The Faulkes Telescope Project (FTP) is the brainchild of English entrepreneur and philanthropist Martin C. “Dill” Faulkes. The aim is to provide free access to robotic telescopes and a fully-supported educational program for teachers and students. “The idea of giving British youngsters access to a world-class telescope immediately appealed to me,” said Faulkes. “I could see that spending a few million pounds making science and maths in schools more interesting would have much more effect on children than spending half a billion on truancy measures”. GLADNESS AT THE GLADWIN. 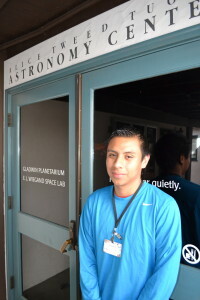 Godinez stands outside the planetarium. Making science “more interesting” was but the flashpoint for Daniel, whose encounter with the FTP marked a blast-off to some stunning achievements: county and state science fair awards; a research mentorship at the University of California, Santa Barbara; a paid teaching assistantship as astronomy tutor with Santa Barbara City College; and planetarium operator at the Santa Barbara Natural History Museum, which eventually led to a staff position as Astronomy Programs Assistant. Access to a world-class telescope certainly made a difference in Daniel’s life. But so did key mentors along the way—starting with the woman who initially forged an unlikely link between this Mexican-American boy and a science program for British students. Kim Miller [disclosure: the writer is Miller’s spouse] has taught science at Goleta Valley Junior High School for twenty years, and learned of the FTP through the Goleta-based parent company Las Cumbres Observatory Global Telescope Network (LCOGT), founded by former Google Vice President of Engineering, Wayne Rosing. LCOGT is a non-profit foundation that aims to build a computer-coordinated network of telescopes around the globe, ultimately facilitating continuous observation of celestial objects. Miller first met Welsh teacher and FTP Director, Paul Roche, at a 2007 conference where LCOGT educator Rachel Ross was presenting. Two years later Roche invited Miller to enroll students (the first in the continental U.S.) in the FTP, which would allocate time on two 2-meter telescopes, one in Australia and the other in Hawaii. From the start, the challenge was destined for the intrepid few. First of all, there was the hour: the scopes are ideally positioned globally for peering into the night sky during the British school day; less so for the U.S. West Coast. And even when a handful of students found the will (and parental permission) to huddle around a computer screen with Miller at 4:00 am, there was never a guarantee until the last minute that the skies might not close-in with clouds. Daniel was one of only two students in Miller’s FTP trial run, and was soon pushing for more. He wanted to use this new resource for a science fair project, and was thus introduced to a network of astronomy experts and educators. He Skype-chatted with Roche. He consulted with astronomer Rachel Street and Ross of the LCOGT. Street helped him understand photometry and “color/color” techniques that reveal whether stars that look close to one another really are, in fact, members of the same cluster. He attended ‘physics tea’ at UCSB with astrophysicists Omar Blaes and Kristian Finlator, learning further about blackbody radiation and how to interpret the effects of cosmic dust. The LCOGT and FT web resources proved invaluable. Using the remote telescope interface via the internet, Daniel directed the telescopes to image a never-before-studied star cluster in the Monoceros constellation. But these pics were just the beginning. Long advisory sessions with Street and Finlator were required to learn how to process the data. Eventually Daniel, and his teammate Caylin Canales, were able to unlock the composition and age of these celestial objects. Their investigation “Aging The Stars” was a triumph, winning a gold medal in the Santa Barbara County Science Fair and fourth place in the Astronomy division at the California State Science Fair. For all that, the night sky was just beginning to deepen for Daniel. He joined a group of local astronomy enthusiasts, The Astronomical Unit, and began attending lectures and ‘star parties’ where telescopes are spread out over the dark museum grounds. 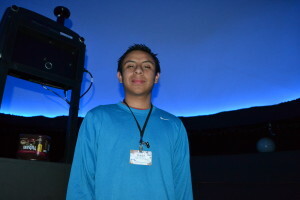 One night after a meeting, Daniel approached Javier Riviera, Director of the Gladwin Planetarium, and sheepishly ventured, “At some point, in the late future, maybe I could help in the planetarium?” To his surprise, Riviera said that the opportunity was available now if he was serious about learning. While astronomy became his passion du jour, its effect leavened his scholastic prowess generally. The feeling of success and the excitement of intellectual growth pushed dreams of college to the forefront. Daniel enrolled in the challenging International Baccalaureate (IB) program at Dos Pueblos High School, committing himself, in effect, to a school within a school, an elite group of 22 highly motivated students immersed in a rigorous program of weighted solid courses. The steeper path would be hard, but it could imprint his transcript with a mark of distinction. It would speak to American colleges certainly; but it could also open the doors to universities abroad—a possibility that has to be considered by any young adult immigrant wondering whether his society regards him as a first or second class citizen. Late last year, Daniel weathered the college application process while continuing to carry a heavy academic load. He worked for a while at a bowling alley to supplement his family income, and contribute to his own vehicle expenses. Suggest to Daniel that, just maybe, driving an extra 25 miles three times a week to a tutoring job that barely covers gas might not be the best use of a high school senior’s time—and you might as well hope to separate gravity from a black hole. It’s not the money—it’s Ariadne’s thread to a dream profession. “An intellectually stimulating position, it not only demonstrates my potential and ability as an individual – it connects me with the academic community that represents my future,” Daniel recently wrote in a personal essay. 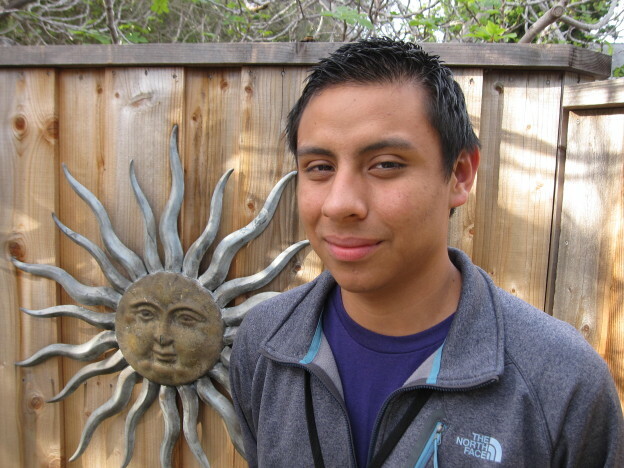 And then, in late December, another star sparkled in Daniel’s sky: Javier Riviera offered him a part-time job as Astronomy Programs Assistant at the Santa Barbara Museum of Natural History—and at nearly twice the pay of the bowling alley. Now he works two jobs that are guide wires to his future. But most extraordinary of all, college responses began with a supernova: Bard College, Annandale-on-Hudson, New York, has offered Daniel their Distinguished Scientist-Scholar Award—a four-year full tuition scholarship. ‘Lucky star’ is not a scientific concept; but it is hard not to read in all of this an array of favorable aspects. With two months of school left, and part-time jobs at the college and the museum, Daniel shows no sign of slackening his pace: ‘escape velocity,’ scientists call it—the speed required for a rocket to break gravity’s hold. This entry was posted in Essays and tagged astronomy, Bard College, Daniel Godinez, education, Faulkes Telescope Project, LCOGT, Paul Roche, Santa Barbara Museum of Natural History, The Astronomical Unit, UCSB Research Mentorship, Wayne Rosing on May 16, 2014 by joemiller.